produce quality, adequately-financed healthcare in Nevada. High Sierra Area Health Education Center (HS AHEC) provides continuing education courses, outreach programs, and special events to promote healthcare worker expertise, career opportunity awareness, and healthcare access to all. The Nevada Healthcare Preparedness Partners (NHPP) Coalition is the primary coalition of Nevada’s hospitals; optimizing preparedness and community resilience in the changing regulatory and technological environment of healthcare. 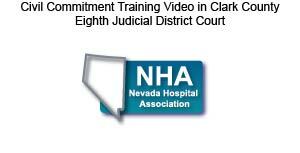 On February 12, 2018, the Nevada Hospital Association partnered with Desert Springs Hospital Medical Center and the Clark County District Courts to provide training to hospital staff on the process for Clark County Involuntary Court Ordered Admissions.